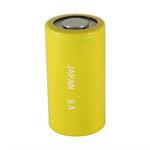 N-1250SCR : Sanyo brand high-output rechargeable 4/5 Sub-C size Ni-Cd battery cell. Home > Battery Cells > N-1250SCR : Sanyo brand high-output rechargeable 4/5 Sub-C size Ni-Cd battery cell. Available plain or with Solder Tabs. N-1250SCR: SANYO-brand 1.2 volt 1250mAh rechargeable 4/5 Sub-C Nickel Cadmium battery cell. Dimensions: 1.31" tall x 0.88" diameter. Weight = 1.79 oz. These have RED shrink wrap. Designed for heavy-duty high-output use, it can be either slow-charged or Fast-charged. Available plain OR with Solder Tabs (for assembly - $ 0.25 extra per cell). Pricing is for 1 battery cell. Picture shows two views of the battery cell.